The once proud image of British Airways is taking a beating from the public and profits. London, England (CNN) -- British Airways' bitter battle with the nation's largest union is bruising the balance sheet of the UK's flagship carrier, leaving the airline -- once the envy of the industry -- with a tarnished reputation amid record losses. Strikes by the airline's cabin crew in March and the worst economic downturn since World War II helped push the airline's losses to a record $765 million before taxes for the year ending March 31. Revenues were down $1.4 billion for the year, requiring commensurate cuts in costs, according to the company. "Returning the business to profitability requires permanent change across the company and it's disappointing that our cabin crew union fails to recognize that," BA said in a Friday statement announcing the preliminary year-end results. Meanwhile, a six-day stoppage in April due to the Icelandic volcano combined with further planned strike actions have cast an ominous shadow over this year's numbers. Brand expert Simon Middleton says while the airline can calculate the money lost due to strikes, it is harder to quantify the impact of travel disruption to BA's brand image. "If you're a member of the traveling public and you want to visit your relatives in Australia or you want to go on your long-promised weekend in New York then you're going to think twice about booking BA simply because you can't rely on them," he told CNN. "There is a potential for a world of disappointment and pain at the end of it and nobody wants to take that risk. In that sense the brand is hugely compromised," says Middleton, the author of "Build a Brand in 30 days." British Airways set the standard in the 1980s and 1990s for service, quality and style. The company itself boasted it was "The World's Favorite Airline." The brand was so revered that attempts to replace the British flag as a feature of the fleet's tail fin failed dismally in the late 1990s. So displeased was former British Prime Minister Margaret Thatcher with the new internationally inspired designs that she famously placed a handkerchief over a model airplane to cover the offending tailfin. So how did a company buoyed by so much pride descend into an airline dubbed "Brutish Airways" by a union which accuses it of bullying staff? "It does reflect a lot of past history where things have been allowed to go unchanged for a long, long time even though the external environment has changed," air transport consultant John Strickland of JLS Consulting told CNN. "There will have to be a lot of pouring of oil on troubled waters in terms off BA's labor force to get them back on board. "Some previous management focus was more on the more positive things like improving revenues and improving products and marketing when the market was in much more of a robust state. They could almost leave it as too difficult, (something) to be done later," he said. British Airways is not the only airline hard hit, although it may be the most high-profile. The 9/11 terrorist attacks in the U.S. in 2001, the rise of low-cost carriers and the global economic downturn forced the airline and the rest of the industry into a radical rethink of cost structure and delivery. "It is a significant force in the airline world, one which others will look to. It is taking a difficult lead in addressing these issues which some of its competitors haven't tried to address -- surrounded by competition from low-cost carriers," Strickland said. The sticking point in union negotiations is not job cuts or pay freezes or any other tactics used by companies to whittle away costs, but the withdrawal of travel entitlements for staff who walked off the job in March. BA says the cabin crew was warned they would lose "heavily discounted" air travel in a January letter. BA made good on the threat for about a quarter of its cabin crew, but the union now says it wants full entitlements back before it signs any wider workforce agreement. A court ruling Thursday cleared the way for a five-day strike from Monday. Two more are planned for May 30 to June 3 and June 5 to June 9, if no deal can be reached. 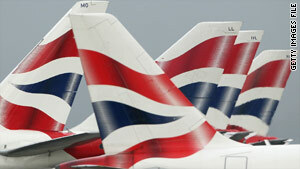 BA plans to fly 70 percent of passengers booked on flights over the five strike dates next week. While back-up plans may succeed in keeping passengers in the air and onside, consultant John Strickland says the airline may have a tougher job restoring morale among its employees. "Damage has already been inflicted, but over time, providing it get backs to focusing on what is has always been well-regarded for -- its quality service, integrity, and operation -- then it can recover, " Strickland said. "But there will have to be a lot of pouring of oil on troubled waters in terms off BA's labor force to get them back on board," he added.